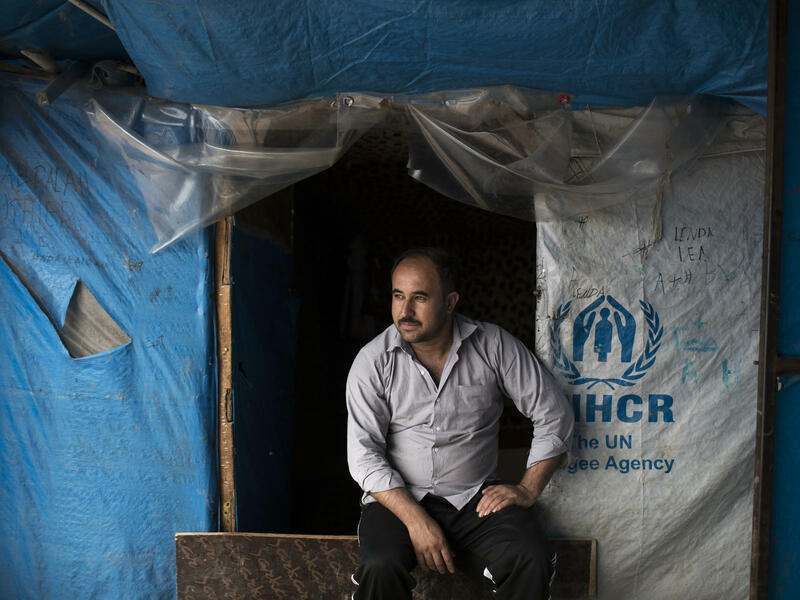 Suleiman Ibrahim Osman, from Syria, sits outside his tent in the Kawergosk refugee camp in northern Iraq in April. He's one of millions of people worldwide who have recently been forced out of their homes from war. Last year began with an angry phone call about refugees, famously leaked later. The newly inaugurated Donald Trump exploded when Australia's prime minister, Malcolm Turnbull, asked him to honor a U.S. pledge to resettle some 1,200 refugees from Australia's offshore detention centers. "This is a stupid deal," Trump fumed to an astonished Turnbull. "This shows me to be a dope." A day earlier, the president had signed an executive order temporarily halting the entire U.S. refugee resettlement program and slashed the number of expected arrivals President Obama had set. Trump complained that by honoring the deal with Australia he was "going to get killed" politically and abruptly hung up the phone. It was the harbinger of policies set in motion to unravel the U.S. refugee resettlement program, an issue that defined Trump's election campaign and has shaped much of his first year in office. Attempts to shut down the program, challenged in the courts, have evolved to more calculated bureaucratic challenges that will have long-term consequences, says Ryan Crocker, a former U.S. ambassador to Afghanistan and Iraq. "This is strategic, that's why it's different from previous anti-immigrant mindsets. It is a conscious effort to deconstruct the system," Crocker says. He points to dramatic budget cuts for the nine private, voluntary agencies that for decades have contracted with the State Department to resettle and integrate the refugee population in communities across the U.S.
"The damage has already been done. These agencies run on the slimmest of margins. The layoffs are already doing structural damage. It's going to take a long time to rebuild," he says. With Trump's travel ban, plus a scaled back refugee program, 2017 was an assault on immigration by the Trump administration, says Jennifer Quigley, a refugee advocate with Human Rights First, a nongovernmental organization in Washington. "There are multiple avenues by which they are trying to cut off different kinds of legal immigration," she says. In September, President Trump dramatically lowered the cap for refugee admissions in fiscal year 2018 to 45,000. That's well below the annual refugee arrivals under President Barack Obama and even lower than most years during George W. Bush's presidency. Over the course of Trump's first year in office, he's repeatedly said refugee resettlement must be temporarily limited due to national security concerns. When he unveiled his first National Security Strategy on Dec. 18, he cited "chain migration" — meaning any immigration to the U.S. based on family ties to a legal immigrant or refugee — as a security threat and called for Congress to reverse America's family reunification policy. But rights groups say they see a bigger aim, supported by powerful anti-immigrants groups: to vastly restrict refugee resettlement as part of a wider agenda to limit legal immigration. The Trump administration is "trying to dismantle the program piece by piece. It's clear they want a smaller program and not include some populations," says Jen Smyers, the advocacy director of Church World Service, one of the voluntary agencies that resettle refugees and now face severe budget cuts and office closures. Trump's reductions to the refugee program reportedly put him at odds with the National Security Council, the State Department and the Department of Defense. But it's not considered low enough for conservative anti-refugee groups that wanted the cap set at zero. "Donald Trump missed a fabulous opportunity to suspend the entire refugee admissions program," activist Ann Corcoran complained to Breitbart News. Corcoran runs the Refugee Resettlement Watch website that regularly claims the resettlement program is corrupt and a health and security risk for communities that accept the newcomers. Ed Martin, president of the Phyllis Schlafly Eagles, a conservative interest group in St. Louis, gives Trump higher marks. "The conversation is going in the right direction," he says. The president doesn't win every battle but Martin believes Trump is mostly winning on immigration. "That's the one thing he can't do to his base is to betray them on immigration," he says. "It will be a big deal" – which, according to some right-wing groups, includes holding down the number of refugees admitted into the U.S. The final tally for refugee admissions in fiscal year 2018 is likely to be closer to 20,000 rather than the cap of 45,000, based on the recent pace of resettlements. "We are on the precipice," says Quigley of Human Rights First. Critics accuse the Trump administration of "slowly smothering" the refugee program and point to a recent announcement that the State Department will shutter dozens of resettlement offices run by voluntary agencies across the country. The agencies are a convenient target, says Becca Heller with the International Refugee Assistance Project in New York. "Taking down the [independent contractors] is a means to destroy the refugee program," she says. Heller's organization has been on the front lines of legal challenges to President Trump's immigration policies, including joining a lawsuit against a travel ban rolled out seven days after his inauguration that caused chaos at international airports. By early March, judges across the country had blocked the ban. "We are in a pitched battle for the continued existence of the U.S. refugee resettlement program," says Heller. "The numbers are going to be low for the next few years and it's our job to keep them as high as we can." The battles are increasingly being fought in the courts. The president's latest legal setback came on Dec. 23, when a Seattle district judge blocked restrictions on refugees from 11 countries, nine of which are Muslim-majority nations. The judge also blocked the Trump administration's suspension of the "follow-on" program that reunites family members with refugees already in the U.S.
"The pipeline is open again," says Smyers, with Church World Service. That pipeline includes more than 2,000 people who have been waiting for family reunification. Heller says there are limits to the president's powers to end the refugee resettlement program outright. Congress established the program's framework and would need to vote to eliminate it. "I think [the refugee program is] under attack but I don't think it's over. For one thing, it's the law," says Heller, pointing to the 1980 Refugee Act that sets out the provisions for the admission of refugees "of special humanitarian concern," and the 1965 immigration law that emphasizes family reunification. "The president may be able to temporarily prevent refugees from coming in," Heller says. "It's not going to successfully dismantle the program without Congress." It is pretty likely that the United States will take in far fewer refugees this year. That's because the Trump administration last year issued a series of orders to limit refugee admissions, especially from mostly-Muslim countries. It ended up placing the lowest cap on resettlement since 1980. NPR's Deborah Amos covers refugees and is with us now to talk about what is ahead for 2018. Welcome. MCEVERS: First, just for context, President Trump campaigned on this promise to make it harder for people, especially Muslims, to come to the U.S. What has happened with refugees in his first year in office? AMOS: Let me give you the official number of refugees admitted in the fiscal year 2017 that ends in October - it was 53,716. And that reflects both Obama and Trump-era policies, but you can already see Trump's impact. So the number's down from Obama's 85,000 a year earlier. And refugee advocates say this is the year the Trump administration tried to unravel the Refugee Resettlement Program, and it's part of this larger assault on immigration. The president framed this as a security issue. He claimed that refugees are a threat. And, you know, in his first week as president, he suspended the refugee program. He issued a visa ban for Muslim-majority countries. Now, he ran into opposition in the courts, and that kept the pipeline relatively open through the year. MCEVERS: So after all these countless court hearings and rulings, what did the administration plan for refugees coming to the United States in 2018? AMOS: So now, President Trump gets to set the cap and he sets it at 45,000. That's the lowest since 1980. But almost everybody who is looking at this says that number will surely be lower than 45,000. AMOS: Because of the legal challenges, because of the increased vetting. For example, a refugee applicant has to supply the names of every close relative and the contact information going back 10 years. Now, think about how hard that is. AMOS: You've run out of a war zone. You're in a refugee camp. Do you know where all of your relatives are? A lot of people are going to have trouble with that. Plus, the private agencies that resettle refugees, they are facing dramatic budget cuts. There are staff cutbacks. Dozens of resettlement offices are going to close early next year. MCEVERS: So does that mean the issue's settled now, I mean, the U.S. is just going to bring in fewer people in 2018? AMOS: It's not settled. I'm going to introduce you, Kelly, to two people on the front lines of the fight. First, meet Ed Martin. ED MARTIN: The conversation is going in a direction that I think is helpful, you know, it's encouraging. AMOS: Now, Ed is a Trump supporter. He heads the Phyllis Schlafly Eagles. That's a conservative interest group in St. Louis. He says cuts to immigration and the refugee numbers are a key demand of Trump's base and that is because of jobs, they say, and security. MARTIN: The immigration problem is real. And if the immigration problem is not addressed, you know, that's the one thing I think he can't do to his base is betray them on immigration. That would be a really big deal. MCEVERS: We know this is important for Trump's base but what about the other side? Is there a lobby for refugee resettlement? AMOS: There is, first of all, at the Defense Department because they care about translators from Afghanistan and Iraq that worked with the military and even in the National Security Council. There are proponents in Congress on both sides of the aisle. And there are activists. One is Becca Heller. She is with the International Refugee Assistance Program in New York. BECCA HELLER: I mean, they've taken every possible step essentially to dismantle the program. AMOS: Heller and IRAP have challenged administration policy in court. And the latest, December 23, a Seattle court reversed a temporary ban on refugees from 11 mostly-Muslim-majority countries. So the refugee pipeline is open again. HELLER: We're in, like, a pitched battle for the continued existence of U.S. refugee resettlement. And the numbers are going to be low for the next few years. And it's our job to try to keep them as high as we can and then assume that we'll have a rebuilding period. AMOS: Now, Becca Heller says that this fight is going to continue into 2018. MCEVERS: NPR's Deborah Amos. Thank you very much.